What is Japan Sun Industries? 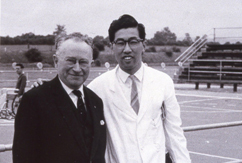 Dr. Yutaka Nakamura, dean of the Orthopedic Department of Beppu National Hospital (NKA Beppu Medical Center) went to the USA and England in February 1960 for a period of 7 months to deepen his research on rehabilitation. In May 1960, he started studying in England’s Stoke Mandeville Hospital, National Center for Spinal Cord Injuries under the supervision of Sir Ludwig Guttmann. (Sir Ludwig Guttmann was a German neurologist who founded the Paralympics Games while living in England, and is considered one of the founding fathers for organized physical activities for people with disabilities) Sir Guttmann implemented the idea of creating a scientific medical team that included not only physicians and nurses but also physical therapists, operational therapists, physical education professionals and clinical social workers, incorporating sports and rehabilitation into one thus resulting in enhancing the recovery of residual functions and endurance power of the　body. Such rehabilitation and treatment process helped many spinal cord injury patients to recover and reintegrate into the society within a short span of time, some as early as 6 months. Dr Nakamura came back home with a determination to use the same technique in Japan. However, at that time in Japan, bed rest was widely practiced to cure physically disabled people who were treated as patients and to let them participate in sports activities was opposed by all the concerned authorities and stakeholders. Meanwhile Dr Nakamura diligently persuaded his patients, doctors, physical education stakeholders, prefecture office, and physically disabled people etc to establish Oita Prefecture Physically Disabled Sports Association. 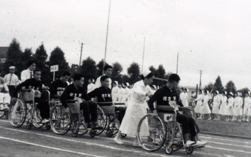 In 1961 October 22nd for the first time in the history of Japan, Oita Games for the Physically Disabled was organized. Also, Dr Nakamura was thinking of organizing Tokyo Paralympics after the conclusion of the Tokyo Olympics as one of his mission. Hence, he started preaching his mission to Ministry of Health and Welfare and other related institution, stakeholders etc but he didn’t receive any positive response from them. 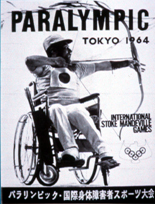 In May 1962, Tokyo Paralympics Preparatory Committee was held where Dr Nakamura strongly appealed to participate in the 11th Stoke Mandeville Games. As a result the committee unanimously decided to dispatch players, but due to the unavailability of funds, Dr Nakamura sold his personal car to cover the travel expenses. 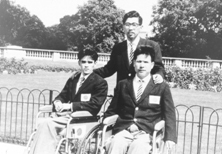 In July 1962, Dr Nakamura along with 2 players from Beppu National Hospital went to participate in Stoke Mandeville Competition which garnered overwhelming attention from all around the world. This led to deepen awareness about disabled sports in Japan and therefore, Ministry of Health and Welfare started focusing on rehabilitation. 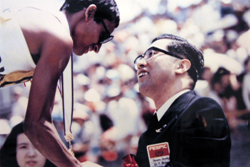 All the efforts and accomplishments achieved by Dr Nakamura so far helped Tokyo to be the host city for the Second Paralympics Games, which was decided by the International Paralympics Executive Committee held in Stoke Mandeville Hospital in 1964. Dr. Nakamura with a vision to improve the welfare of people with disabilities in Asia and South Pacific region through sports, proposed to hold the FESPIC (Far East and South Pacific Games for the Disabled) Games. 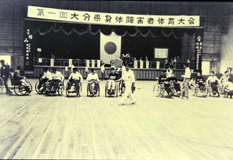 This game, one of a kind in Asia was just a sports event for many, but Dr Nakamura’s aim was to raise awareness and disseminate disabled sports in most of the developing countries and to develop welfare system for disabled people around the region. 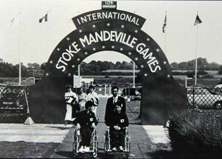 Unlike the Stoke Mandeville Games where only the spinal cord injuries athletes participated, this sports event was for all the disabled people regardless of their disabled types ( such as visual, spinal cord injury, cervical spinal cord injury, CP, amputee etc). 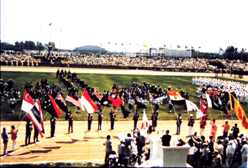 In June 1975 the First FESPIC Games was held in Beppu city where 973 athletes from 18 different countries participated in various disabled sports. This event was held every four year and bowed out a success, at the conclusion of the 9th FESPIC Games in Kuala Lumpur, Malaysia. Australia, Hong Kong, Kobe, Indonesia, Peoples Republic of China, Thailand, and Republic of Korea have also hosted this event. In 2006, FESPIC Federation was merged with the Asian Paralympics Council and renamed as Asian Paralympics Committee. Since then it has been taken over as Asian Para Games. Dr Nakamura had requested the organizer of Beppu Mainichi marathon to let wheelchair athletes to participate in the marathon competition but his request was rejected straightforward. The reason was that running means to move forward with two legs, but in the case of wheelchair it is more like a bicycle race than running. However, Track-and-Field Association was cooperative to organize racing event solely for wheelchair athletes although there was some voice raised against the race as it was believed to be dangerous for a wheelchair athlete to participate in a marathon. 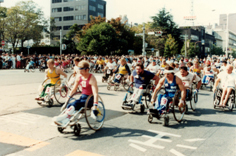 In 1977, 9 wheelchair athletes participated in the 5th Beppu Road race, completing a 2.7km course. 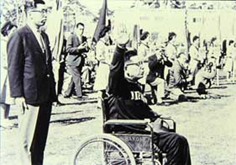 In 1981 to celebrate the International Year of Disabled Persons, Dr Nakamura proposed to organize Wheelchair Marathon which was supported by Oita prefecture and other volunteer organization. Hence, the 1st Oita International Wheelchair Marathon was held in Oita city in November 1st, where 117 athletes representing 14 different countries participated in half marathon (21.0975km). 20 athletes from Japan Sun Industries participated in this race and completed the course successfully. George Freund from Austria was the first to finish the race in 1hr1min46sec. During the race, Dr Nakamura was busy taking cardiopulmonary function measurement of the athletes for medical research purpose. The following year he participated in International Paraplegia Medical Society in Athens, Greece where he presented that Wheelchair Marathon has excellent rehabilitation effects for people with spinal cord injuries. The 3rd Oita International Wheelchair Marathon was held in 1983 after which it became full marathon and was officially recognized by the International Stoke Mandeville Games Federation (ISMGF). 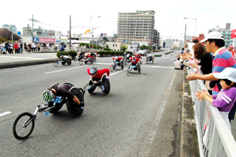 Held every year in Oita, now this race has developed into one of the world’s largest and the best, applauded by many supporters along the roadside and received by the citizens with respect. Copyright (C) 2002-2013 Japan Sun Industries. All Rights Reserved.